The Popocatépetl volcano area located in the states of Puebla, Mexico is well known for UFO Sightings and eerie lights moving above and near the volcano. After an eruption of the volcano on June 19, 2016 something strange happened again when suddenly mysterious lights appear above and near the volcano. 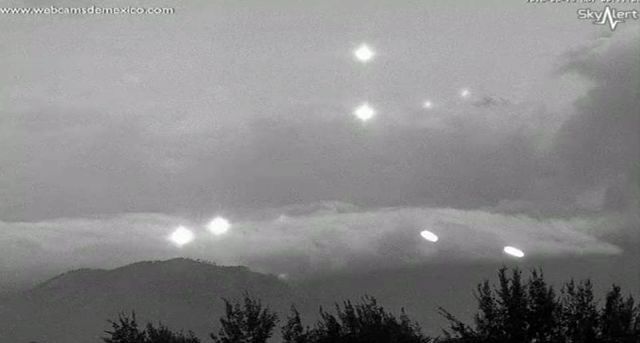 It seems like many ufo’s/orbs are flying around and above the volcano but there is an explanation for this phenomenon? Could it be a reflection of the webcam camera and these lights are small molten rocks “lava” expelled by the volcano during the eruption and falling back to the ground or the webcam captured something unnatural? Known as the Hessdalen Phenomenon, the flashing orbs can be as large as cars and have even attracted attention from ufologists. But now scientists think the unusual lights could be formed by a natural ‘battery’ buried deep underground, created by metallic minerals reacting with a sulphurous river running through it. More about Hessdalen lights read here: Hessdalen lights mystery been solved? UFO (escape pod) filmed flying in opposite direction from space debris?